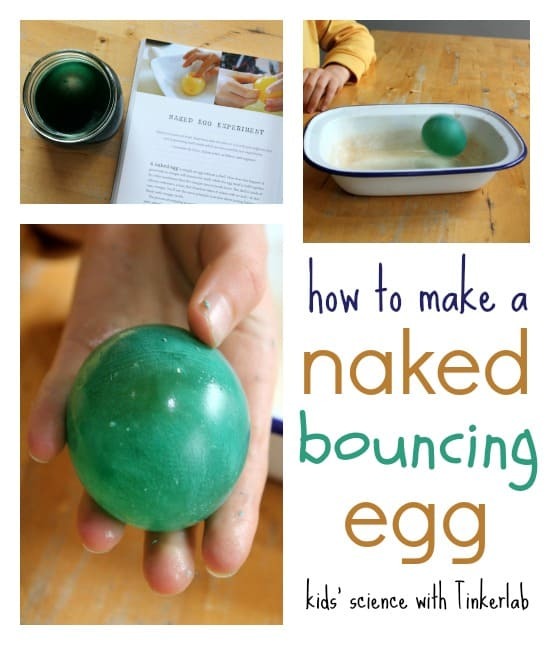 Here’s a super fun kids’ science experiment from the Tinkerlab book :: we’re making naked eggs that bounce! 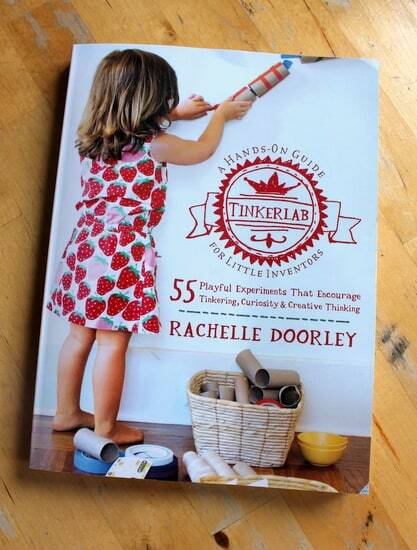 Have you got your copy of the new Tinkerlab book yet? 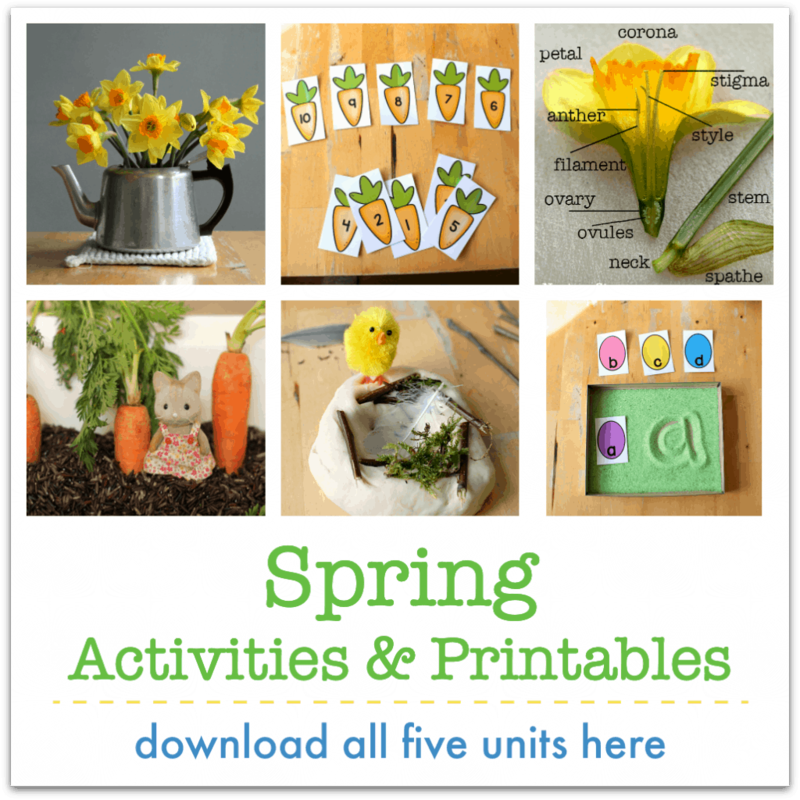 Rachelle Doorley has filled it with playful experiments that encourage children to explore, tinker and discover. :: the ideas are fun. Rachelle is an art and museum educator with years of experience of working with children, and every idea in the book presents a hands-on, engaging project that is full of learning opportunities. From my daughters points of view though they are all just are ‘cool!’, and they couldn’t wait to started. It’s so good to have a book that sparks so much enthusiasm! :: the book is full of fantastic photos – which makes it really easy for them to browse through the book by themselves, to pick the activities that really appeal to them. They took the book to bed with them so they could write a big list of which projects they wanted to try first. :: each project is laid out clearly, making it easy to set up and try out. With just a little help, my children were able to gather the materials they needed and follow the instructions to get their project started. They really liked being ‘in charge’ of their own science lab. Tinkerlab includes lots of ideas you can use to set up a home or classroom that enables lots of child-led experiments and fosters lots of creative play. :: it covers such a range of projects, so all children can find activities that really appeal to them. The main sections include Design, Build, Concoct and Discover. There are 55 experiments in the book but there are also lots of ideas for extending or altering them, giving you a huge resource in one book. :: there are lots of suggestions from Rachelle for questions you can ask your children as you explore the activities, which help you get the most from each project and encourage creative thinking. :: the book includes thoughtful and thought-provoking interviews with contributors who are experts in children’s play and learning. These, which include Elliot Eisner from Stanford University and Grace Hawthorne of ReadyMade magazine, make the book an extra interesting read for parents and teachers, as they prompt you to think about the environment you provide for your children, and how to foster and coach creative play and learning. 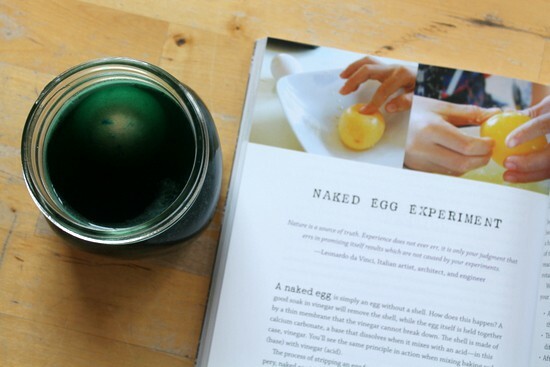 For a peek inside the book, I thought I’d show you one of the experiments we tried: the naked egg experiment. Sounds fun? My girls loved it! 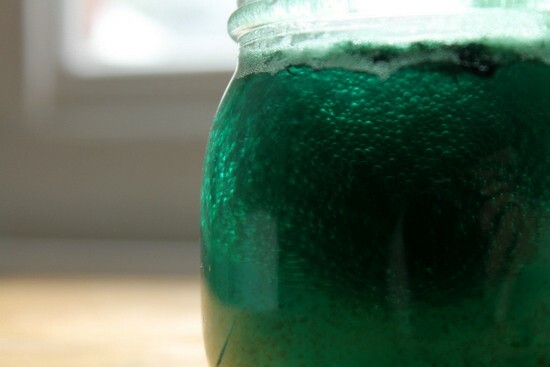 You use vinegar to dissolve the shell off a raw egg. 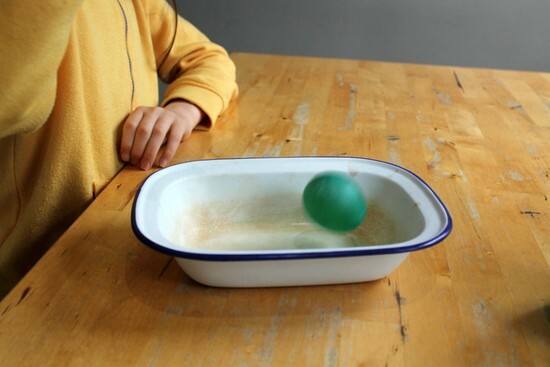 This gives you an un-cooked, squishy, bouncing egg – which is super sensory and fun to play with, especially given the little dash of daring that comes with knowing it could pop at any time! The experiment also gives your children the opportunity to go through the steps of gathering materials, setting up an experiment, waiting and watching what is happening, and wondering and theorising about what is going on. Tinkerlab prompts you to talk with your children about what is happening. What do the children observe? Where has that shell gone? 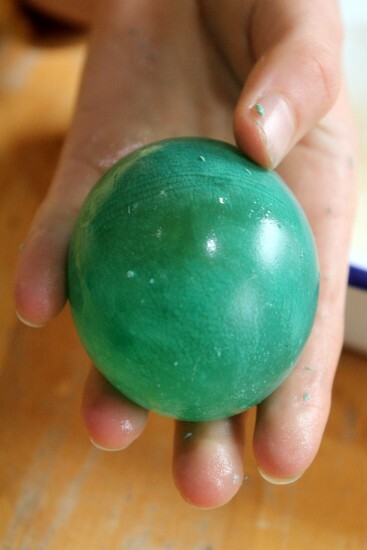 You can add some food colouring to your naked egg experiment if you want to, giving you a rather pretty, very squishy result. And look what happens when you gently drop your egg from a height. It bounces! 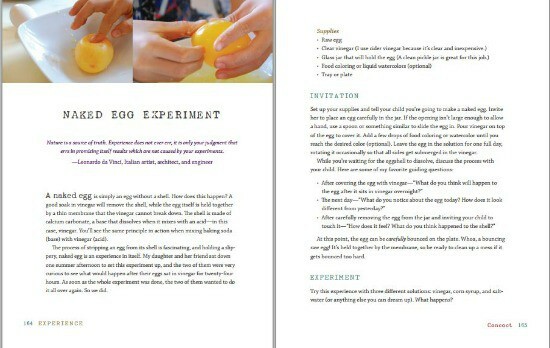 My children found this so fun to see – it really intrigued them to see how the egg had changed. The egg will eventually pop, revealing that it really is still raw inside (so you’ll want to do your bouncing in a bowl or tray) – and as a mark of how much the experiment had caught their interest, they wanted to do it all over again straight away! 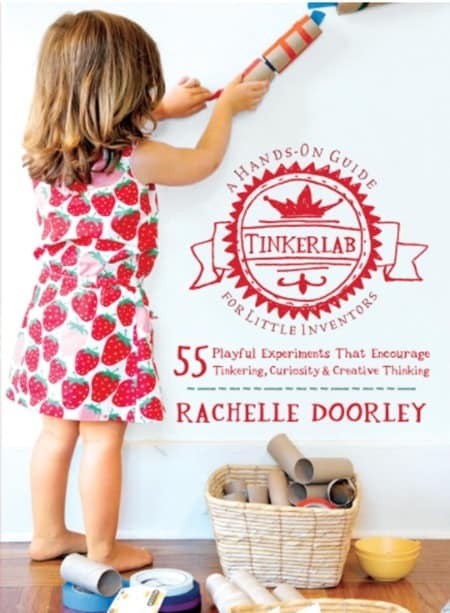 To set up your own Tinkerlab and start playing with all the creative experiments, you can get your own copy of Tinkerlab by Rachelle Doorley from Amazon and all good bookstores.